Last year I read Apartment 16 by Adam Nevill, and reviewed it here. As you can see, I thought there was a fair bit wrong with it, but also felt it had promise. 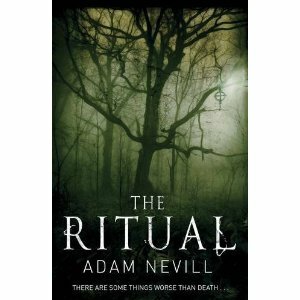 So I had high hopes when I picked up The Ritual, Nevill's next book, apparently selling rather well at present. I was, however, left ultimately dissatisfied. The general set-up of The Ritual is a good enough idea, although not what I'd call startlingly original: four old friends who have grown apart since university and are now in their 30s, go on a hiking trip to Sweden for a bit of outdoorsy male bonding and suchlike. Predictably enough, they get lost in the woods; also predictably there are horrors lurking there. However, if you can ignore some clunky writing and dull exposition in the first chapter or two, the first half of the book is by the far the best. It's scary - which is the main thing we're looking for from a horror novel, after all - and moreover, it's scary in the claustrophobic, oppressive way of all the best horror stories. Lost in the forest and with a nagging, sickening suspicion that the slaughtered animal they've found hanging in a tree was not left there, as they try to convince themselves, by a bear, the four men take shelter in an old, deserted house, and that's when the chills really start. There are moments of real, shuddering creepiness here, and it's also in this first half of the book that we learn a little more about the characters and their complex relationship, all of which is convincing stuff. Unfortunately, the second half of the book just doesn't live up to this. It's tense and action-filled, and there's plenty of gore and some rather repetitive violence, but for the most part, the proper scares just aren't there. The main character is subjected to various horrible experiences, but in such a laughably daft setting and by such laughably daft perpetrators that I found myself regularly sighing with irritation as the plot - of which there is little - became increasingly absurd. It would be unfair of me not to say that there are some outstanding shocks in the second half- well, no, there's one, if I'm being really honest, but it was a jaw-dropper, and if there'd been more of that kind of thing in the rest of the book instead of the nonsense into which it largely degenerates, I'd have been far more enthusiastic about The Ritual. But there wasn't, and as such, despite the gripping first half, I was disappointed.